Roscoe is ready for the spring and summer. We are ready to start our fun filled times of backpacking, hiking and camping together. He officially hit a-year-old in November. He was sold to me with parvovirus but he fought through it. I took him backpacking once last summer at seven months old and he did very well but there is just a lot of dangerous snakes in the areas and copperheads that just made me uncomfortable with him being a puppy still. However, it only took him that one time to know what my backpack and his backpack meant we were going to go do. So he's been real excited since he sees me getting gear prepped for this season coming up. Can't wait for the lifetime of companionship we get to have out on the trails. Comments for Ready For Spring! where do you get dog backpacks? [Note from Anton:] You can find several different dog backpacks on Amazon here. You do have to tighten it down well. You can tighten it down to where you can fit two fingers against the chest and belly. Also make sure the front strap are tucked behind the dogs front legs aka the armpit area of the front legs. The pack may be loosening itself when the dog is in motion if this is the case when you get the desired tightness tie a knot at the base of the plastic piece to prevent this. How do you keep the backpack from slipping? 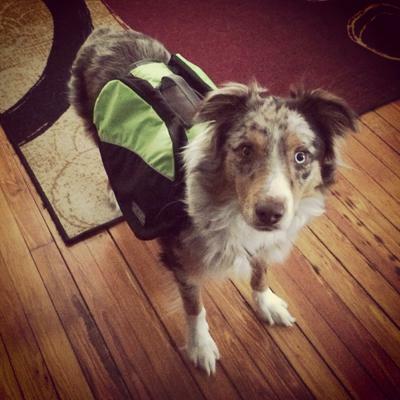 My dog's backpack slips regardless of what I've tried... with balanced light loads, or completely empty, tighter, looser. I would really like to use it, but it constantly slips to one side. I have hesitated from making it really, really tight.